Your baby's extra-delicate skin requires the best care and that means bathing baby with soap-free body wash. Gently cleanse your child's skin with Sebamed Baby Wash Extra Soft. Gentle enough to use every day, this moisturizing cleanser naturally softens and soothes with allantoin and squalane to keep even the most sensitive baby skin at its huggable, healthy best. Unlike regular soap that can cause dryness and irritation, Sebamed Baby Wash's ultra mild emollient formula supports the moisture balance of your baby's delicate skin. Explore the entire range of Bath Time available on Nykaa. 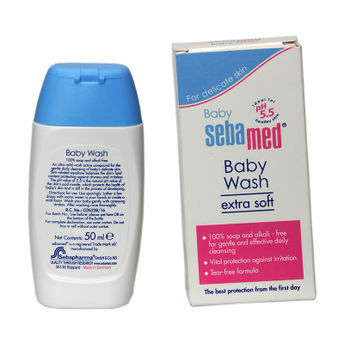 Shop more Sebamed products here.You can browse through the complete world of Sebamed Bath Time .Alternatively, you can also find many more products from the Sebamed Baby Wash Extra Soft range.